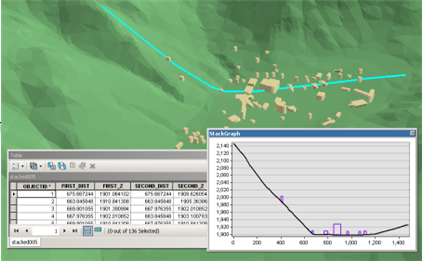 Creates a table and optional graph denoting the profile of line features over one or more multipatch, raster, TIN, or terrain surfaces. If the Output Graph Name parameter is populated and the tool is executed in ArcMap, ArcScene, or ArcGlobe, the resulting graph will be displayed on-screen. Each input line is densified to interpolate the height along its overlapping profile targets. The elevation and distance along the input lines created by this densification gets stored in the output table along with information about the line features and profile targets. FIRST_DIST—Distance to the first vertex in the profile segment. FIRST_Z—Height of the first vertex in the profile segment. SEC_DIST—Distance of the second vertex in the profile segment. SEC_Z—Height of the second vertex in the profile segment. LINE_ID—Unique ID of the line feature used to define the profile. SRC_TYPE—Data type of the profile's source, which is either a surface or multipatch. SRC_ID—Unique ID of the multipatch feature being profiled. Not applicable for surface inputs. SRC_NAME—Name and path to the profile's source. The line features that will be profiled over the surface inputs. The data being profiled, which can be comprised from any combination of multipatch features, raster, and triangulated surface models. The output table that will store the height interpolated for each profile target that intersects the input line. The name of the output graph that can be viewed in ArcMap, ArcScene, or ArcGlobe. which are then saved as graph files.